This PDF 1.5 document has been generated by Microsoft® Word 2013, and has been sent on pdf-archive.com on 07/04/2018 at 08:39, from IP address 69.94.x.x. The current document download page has been viewed 215 times. File size: 392 KB (6 pages). them to disassociate from tāghūt and disbelieve in it. transgressed upon. From the pillars of the tawhīd of Allāh is that He alone has the right to legislate. major shirk. The evidences for this from the Qurān and the Sunnah are explicit and plenteous. sallam), to obeying and following the tāghūt” (I’lam al-Muwaqqi’īn). clergy members to include all voters of the citizenry, as democracy is “the rule of the people”. desires. Through the ballot boxes, laws and constitutions are legislated, to be ruled and judged by. with the desire of the people. – and disbelieve in it if he has not abandoned the democratic vote. disbelievers in Hell all together”(an-Nisā 140). in part of the matter.’ And Allāh knows what they conceal” (Muhammad 25-26). am disassociated from you. Indeed, I fear Allāh, Lord of the creation” (al-Hashr 17). wishes to lead them far astray” (an-Nisā 60). good and concord’” (an-Nisā 62). the plot of Shaytān has ever been weak” (an-Nisā 76). wrath from Allāh, and for them is a great punishment” (an-Nahl 106). over what they have been concealing within themselves” (al-Mā’dah 51-52). tāghūt by voting and thus consenting to “the rule of the people” shared by all voters? their refuge is Hell – and what a horrible destination it is” (an-Nisā 97). whom Allāh could pardon, and Allāh is ever Pardoning and Forgiving” (an-Nisā 98-99). does not guide he who is a liar and severe disbeliever” (az-Zumar 3). besides Allāh – intending thereby to draw closer to Him – not aid them? But they indeed failed them. That was their falsehood and that which they had fabricated&quot; (al-Ahqāf 27-28). from takfīr. 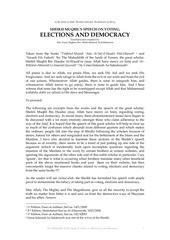 These āyāt and others prove that the “Muslim” voter is a murtadd tāghūt […]. form the tāghūt for any democratic nation? have forever emerged between us and you until you believe in Allāh alone’” (Mumtahanah 4). disassociated from what you do’” (Yūnus 41). from the kuffār thereby” (Ad-Durr al-Manthur). This file has been shared by a user of PDF Archive. Document ID: 00754143.